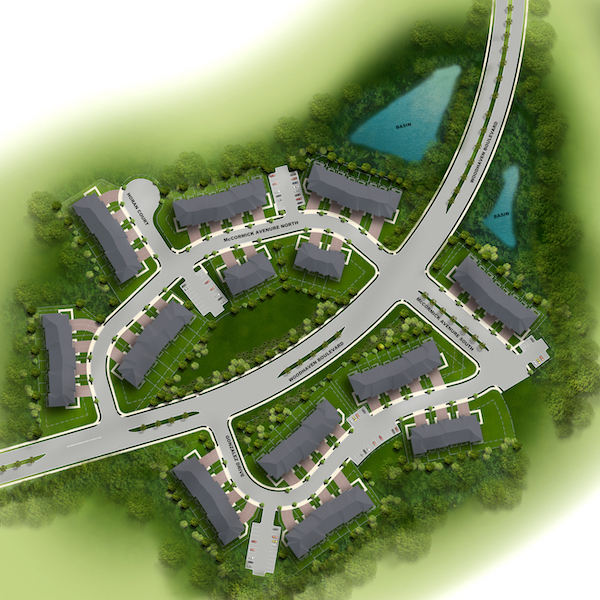 If you are looking for a new townhouse for sale in Old Bridge, NJ look no further than Barclay Brook Village. Here you will find luxurious townhouse living in NJ in our new construction townhomes, where daily living is infused with comfort and distinction. One step into the foyer of these new homes reveals a breathtaking open floor plan with a living room; gourmet, eat-in kitchen; and dining room that can accommodate both daily living and entertaining with grace and ease. Enjoy the natural wooded surroundings as you open the sliding doors from the breakfast nook to your very own private deck. The two-story gathering room in the townhouses at Barclay Brook Village easily becomes the social and visual focal point of the home, beckoning with its soaring ceiling and direct-vent gas fireplace are the perfect place to accommodate friends and family. Privacy and luxury come to the forefront again in the master suite at your new home. This expansive retreat includes an exquisite bathroom and dual walk-in closets. Here you can keep to your own and relax as the master suite is privately removed from the 2-3 secondary bedrooms and 1-1/2 additional baths for your family or guests. Why live in Old Bridge, NJ? Life at Barclay Brook Village is designed to be efficient and convenient for all of its residents. Find comfort and all of the amenities you need right here, from the one-car garage and full, finished basement to the step-saving second floor laundry. Luxury home living and convenience come together perfectly in our new construction townhomes in NJ to create a lifestyle of exciting possibilities. The choices are endless, choose to head “down the Shore,” take advantage of our prime location, our close proximity to the New York City area and all it has to offer, or simply enjoy the natural surroundings of Woodhaven Commons. Looking for a new home in Old Bridge, NJ? Schedule a tour of our brand new homes today! All you need to do is contact us! Click on the button below!